The Kris Stool by Amisco comes in three heights: the featured counter height stool, a bar height version, and an extra tall spectator height for those extra tall surfaces. The Kris Counter Stool is ultra modern in form, with generous curves and plush cushioning. The Kris Counter Stool pictured shows a metallic frame finish and a dark black cushion, which heightens the ultra modern appeal. Should you desire a more down-to-earth or perhaps a zany look, you may customize the frame finish and cushion fabric to meet your unique needs. 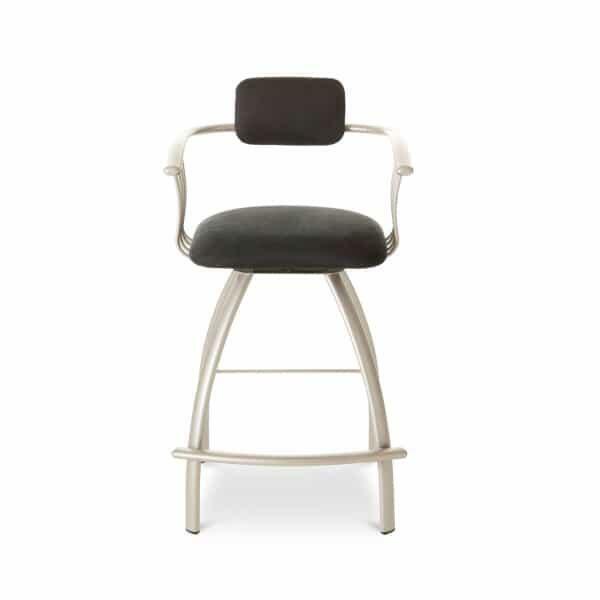 The Kris Counter Stool features a frame that is entirely steel, and is coated with a baked powder finish that protects it from unwanted scratches. For comfort, the counter stool features a plush seat cushion, a seatback that also features a comfort cushion, two armrests and a footrest that wraps all the way around the base of the chair. The seat sits on a swivel so you’ll be able to engage with whatever is happening at your countertop.